On July 5, 1973, Kingman was the site of a catastrophic BLEVE (Boiling Liquid Expanding Vapor Explosion) which killed 11 firefighters. The explosion occurred following a fire that broke out as propane was being transferred from a railroad car to a storage tank. This explosion has become a classic incident studied in fire department training programs worldwide. 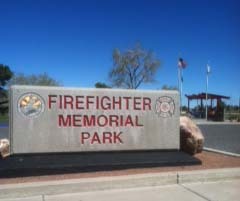 It is for these eleven firefighters that I rode through many of the streets of Kingman. Ahron Sherman and the photographer from the Kingman Daily Miner met me at the Firefighters Memorial Park to help to spread word of this ride throughout their hometown. Their interest in One Million Acts Of Kindness was refreshing. As I rode today, the applause, waves and horns were a continous sight and sound. Roger Dixon Battalion Chief Fire from Station 1 talked to me in great detail of the tragedy. It is amazing to me that a training seminar about fighting this type of fire was on the schedule to be taught to these men six days after the tragedy. Stopping at City Hall, Debbie Francis, retired Police Officer and now City Clerk in Kingman was very appreciative when learning of The Kindness Bicycle Ride for Heroes. At day’s end Fire Chief Thomas O’ Donohue of Golden Valley, Arizona and his wife stopped by The Kindness Bus and Kindness Bicycle as they were parked and I was writing this blog. A connection he has, is that he worked with and is friends with International Fire Chief Al Gillespie. This is amazing to me as I am hoping to hear from the Chief, some words about Heroes that I can take to children in classrooms across the country. This entry was posted on Thursday, March 22nd, 2012 at 11:00 am	and is filed under Kindness. You can follow any responses to this entry through the RSS 2.0 feed. You can leave a response, or trackback from your own site.